Wait, a podcast on a Thursday? 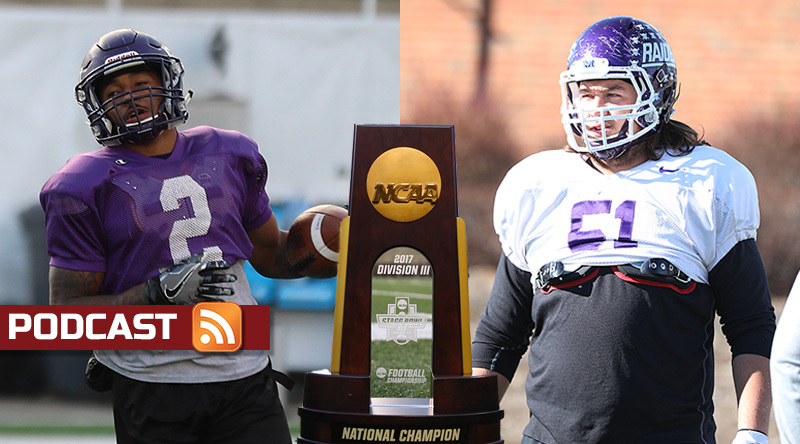 Yep, that’s right — Pat Coleman and guest analyst Frank Rossi step up to the mic in Salem for a special edition of the D3football.com Around the Nation Podcast focused on getting you ready for Stagg Bowl XLV. We talk with players on both sides for their perspective and highlight a couple of places where the game Friday night could well turn. Plus, we talk with UW-Oshkosh coach Pat Cerroni about how the semifinal game ended, what it was like to attend the Gagliardi Trophy ceremony in a year where his team isn’t playing, as well as whether he considered throwing the ball to the end zone rather than attempting a field goal on the final play of the game. This entry was posted in Around the Nation and tagged Mary Hardin-Baylor, Mount Union, UW-Oshkosh. Bookmark the permalink.